1 liter vrugtesap konsentraat, 100% suiwer vrugtesap mengsel, maak aan met 5 liter water. Vervaardig deur Magaliesberg Sitrus. Bevat geen preserveermiddels, MSG of rietsuiker nie. Die SA Aandag Afleibaarheids Ondersteuningssentrum onderskryf hierdie produk. Kontak my gerus en vind uit van spesiale aanbiedinge op groot maat. Groot maat = 12 x 1L bottlels. 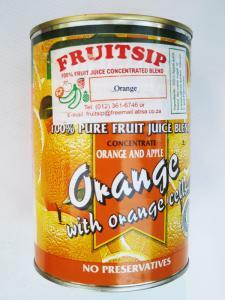 1 liter fruit juice concentrate, 100% pure fruit juice blend, mix with 5 liter water. Manufactured by Magaliesberg Citrus. Contains no preservatives, MSG or cane sugar. The Attention Deficit Hyperactivity Disorder Support Centre of SA endorses this juice. Feel free to contact me for any enquries regarding special offers on bulk purchases. Bulk = 12 x 1L bottles. An orange�specifically, the sweet orange�is the citrus fruit Citrus sinensis (syn. Citrus aurantium L. var. dulcis L., or Citrus aurantium Risso) and its fruit. The orange is a hybrid of ancient cultivated origin, possibly between pomelo (Citrus maxima) and tangerine (Citrus reticulata). It is a small flowering tree growing to about 10 m tall with evergreen leaves, which are arranged alternately, of ovate shape with crenulate margins and 4�10 cm long. The orange fruit is a hesperidium, a type of berry. Oranges originated in Southeast Asia. The fruit of Citrus sinensis is called sweet orange to distinguish it from Citrus aurantium, the bitter orange. In a number of languages, it is known as a "Chinese apple" (e.g. Dutch Sinaasappel, "China's apple", or "Apfelsine" in German). The name is thought to ultimately derive from the Dravidian word for the orange tree, with its final form developing after passing through numerous intermediate languages. Click on the right to order now. Payment: Electronic Transfer or COD. Kliek regs om nou te bestel. Betaling: Kontant by aflewering of per elektroniese oorplasing.